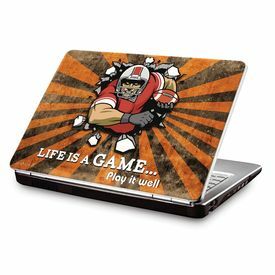 Buy Clublaptop LSK CL 87: Life Is A Game - Play It Well Laptop Skin online - Clublaptop - The largest online store by Manufacturer of Laptop Accessories and Spares. Flaunt Your Style - with our innovatively trendy, glamorously stunning and fashionably exciting laptop skins. Each Laptop skin is custom designed and printed to perfection to reflect your attitude and style statement. CL Laptop Skins are absolutely stunning in looks and safe to use on your laptop. Each one of Laptop skin is made from premium material to give amazing look, finish and ensure long life to your laptop. > Available in Universal size - 15.6"